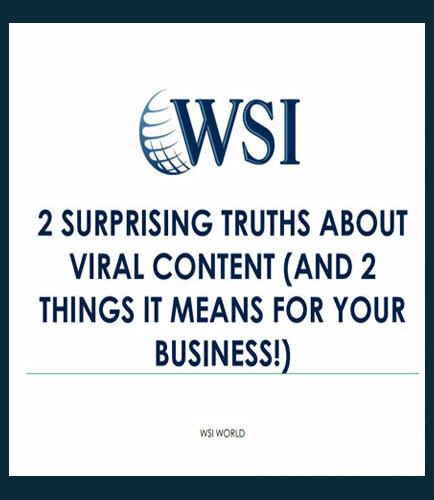 "Viral Content's Truth that can affect your Business"
Viral content is contagious and the persuasion of viral marketing has an enormously strong pull.The goal of viral marketing is to create vcontent that goes viral and it spreads quickly via social media and is viewed, read and shared hundreds or thousands of times. But does creating viral content can benefit your products and services? Will the audience enjoy a little bit of purposeful viral marketing? Focusing on creating highly valuable and useful content that caters to audience’s needs should be main goal. When it comes to viral content and marketing, the ability to gauge your audience is extremely important. What’s the difference between viral marketing and viral content? Why Viral Marketing can be dishonest? Does viral content provide more value to the customers? What is WebDav? What does WebDav do? Web Distributed Authoring and Versioning is an extension of the HTTP protocol. WebDav is an access protocol for data that provides a framework for users to create, change and move documents on a server. It provides support for remote collaborative authoring of web sites and individual documents, as well as remote access to document based systems. Advantages of using WebDav for Windows File Sharing: WebDav supports secured connection. WebDav enables seamless integration with the IIS Manager. Allows administrators to specify custom WebDAV file sharing with security. Supports both sharing and exclusive locks to prevent lost updates. Provides access to any cloud data by securing WebDav irrespective of whether the underlying cloud supports the protocol natively. This whitepaper explores the below topics: About WebDav protocol: How does it work? Connecting to WebDav Servers and Windows Shares. Why WebDav as a Cloud Connector? Why choose WebDav over Common Internet File System (CIFS)? How to create a WebDav server? Securing WebDav Servers: Steps required to secure WebDav servers. Download this whitepaper to learn more about file and data access through WebDav and how to secure WebDav service. Creating effective automated campaigns can save time, energy and resources to engage new leads and current customers. Learn in this case study how a prominent SaaS company increased lead generation by 19% with improved marketing campaign management. How implementation of 123ContactFor lead-capturing form can reduce the campaign creation and implementation time to one working day.